Vested Interest in K9s, Inc. is an East Taunton based all volunteer 501c(3) non-profit dedicated to outfitting K9s with ballistic vests. Event proceeds will provide bullet and stab protective vests for law enforcement dogs. Registration: 9:30am-11:30am. Kickstands up at noon sharp! This will be an event like no other! A law enforcement tribute and flag raising ceremony will be followed by a one hour police escorted scenic motorcycle ride, BBQ, entertainment, meet MMA Fighter, Lee Beane, "THE BEAST" current CFX (Cage Fighting Xtreme) Heavyweight Champion, dunk your favorite police officer in the dunk tank, Black belt karate demonstration by Eclectic Karate of Lakeville, vendor marketplace, K9 demonstration, chainsaw carving demonstration, raffles and more. Special appearance by the Hooters Girls from 2:00pm-4:00pm. Bring your unwanted/broken jewelry! Instant Cash paid on site for your unwanted/broken, gold, silver, platinum, flatware, jewelry, coins and dental crowns. GoldnSilver, Precious Metals Broker will donate 15% of the total $ purchase to Vested Interest in K9s, Inc. while you received full value of the metals you sell. Book your own “Gold Event” & Vested Interest in K9s will receive $100 per party. Online registration and “Hog Wild” tee shirts may be purchased at www.vik9s.org. Tickets are also available locally at The Pet Food Shoppe 6 Harding St., Lakeville (Hours: Mon-Fri 7:30-6:30, Sat 8-5, Sun 10-4) and Prisco’s Market & Deli 8 Romney Way, Bridgewater (Hours: Mon-Sat 10-6, Sun 10-5) and onsite the day of the event. $25 for individual rider, $40 for rider and passenger and $15 for non rider, which includes the BBQ and entertainment. Kids under 12 are FREE. All sales final. Please note this is not a pet friendly event. 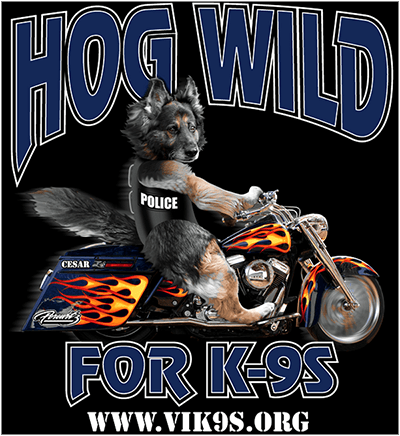 Anyone interested in volunteering, donating services or raffle prizes at the Hog Wild for K9s Charity Motorcycle Ride please email info@vik9s.org or call (508) 824 - 6978. Monetary donations may also be made directly on the website www.vik9s.org.